You've heard the jokes about cops in doughnut shops, but Friday they're on them. 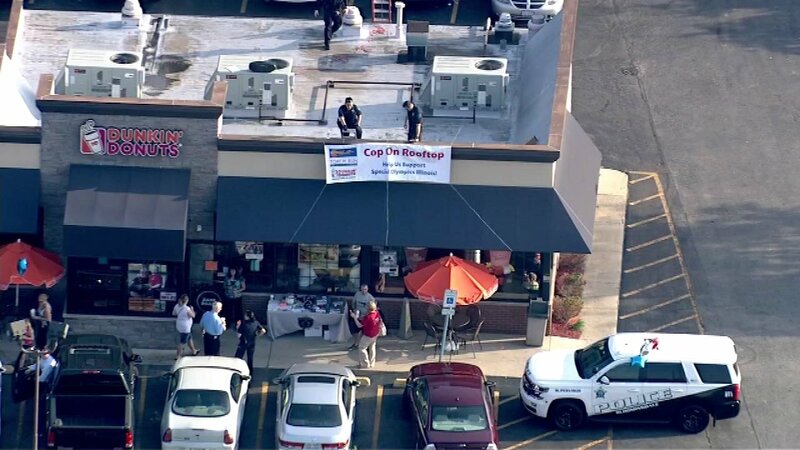 Chopper 7HD spotted several officer on the rooftops of Dunkin' Donut shops in places like Roselle and Oakbrook Terrace. They're raising money for Special Olympics Illinois. They hope to top last year's donations, which totaled $672,000. Each person who visits a cop on a rooftop and makes a donation will receive a free donut coupon and people who donate at least $10 will get a Law Enforcement Torch Run travel mug and a coupon for a free medium coffee. It is the 15th year in a row that law enforcement officers from across Illinois have taken part in the fundraiser.